Background from Freiburg 2013: Hidden as an uncharacterized E. coli locus for more than 15 years, Barrangou et al. identified the CRISPR (Clusterd Regularly Interspaced Short Palindromic Repeats) array as a previously unknown adaptive prokaryotic immune system. Almost half of all prokaryotes make use of this defense mechanism against unselective uptake through natural transformation, phage DNA transduction or horizontal gene transfer by conjugation. Invasive DNA or even RNA can be specifically recognized and efficiently cleaved. 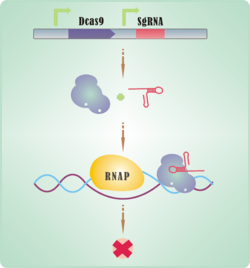 This unique feature results from the interaction of non-coding RNAs and CRISPR associated (Cas) proteins. From a wide range of known CRISPR subtypes we used CRISPR type II b of S. pyogenes. Abstract: The past decade has seen the emergence of robust bioprocessing strains engineered to synthesize discrete molecular products. The next-generation of strains could be “programmable,” with on demand generation of molecules within a bioreactor e.g. a yogurt fermentation capable of making any combination of flavouring, nutrients or pharmaceuticals. While merging all this potential into single hosts seems efficient, it would also bring added risk in the case of a process failure due to bacteriophage infection. Here, we not only rationally design widespread immunity to phage infection, but also hack this immunity system to yield programmable biosynthesis at the community level. We demonstrate this by building both broadly and specifically neutralizing CRISPR systems that were paired with biosynthetic capabilities for vanillin, caffeine and cinnamaldehyde production. Eventually, a fermentative process could exist that is vaccinated to phage infection but susceptible to targeted phage addition that results in a programmable probiotic – or ultrabiotic. Abstract: In nature, there exist a variety of magnetotactic bacteria. Recently, it was reported that non-magnetotactic cells such as yeast can be magnetized to some extent. We set the goal to transform E. coli into those that are attracted by magnets. By magnetizing E. coli, the cell harvesting process will be much simpler and more economical than the conventional processes such as centrifugation and filtration. To this end, we are conducting three itemized projects. (1) modification of iron transportation network to import as much Fe ions as possible in E. coli, (2) sequestering/ storing iron into human ferritin, and (3) converting cytosolic space from reducing to oxidizing in order to elevate Fe(II)/ Fe(III) ratio within. Because all such manipulations significantly impact the physiology of the host cell, we are establishing the BioBrick platform that enables the temporal knockdown of multiple genes using recently control technology such as CRISPRi. Abstract: Synthetic gene circuits have the potential to revolutionize gene therapies and bio-industrial methods by allowing predictable, customized control of gene expression. Bistable switches and oscillators, key building blocks of more complex gene networks, have been constructed using naturally occurring and well-characterized regulatory elements. In order to expand the versatility and variety of these circuits, we designed and constructed gene networks using artificial transcription factors (ATFs). The ATFs are of two classes: inhibitory TAL proteins and a catalytically inactive dCas9 protein with small guide RNA elements, each orthogonal to the yeast genome. Using mathematical modeling, we determined the parameters expected to create bistability and oscillation, using tandem binding site kinetics to achieve cooperativity. Based on these results, we assembled a library of plasmids containing ATFs, binding sites, regulatory elements, and fluorescent reporters. We then integrated these genes into the genome of Saccharomyces cerevisiae and are currently characterizing them using flow cytometry. Qi L.S, Larson M.H, Gilbert L.A, Doudna J.A, Weissman J.S, Arkin A.P, Lim W.A: Repurposing CRISPR as an RNA-guided platform for sequence-specific control of gene expression. Cell 2013, 152:1173-1183. DiCarlo J, Norville J, Mali P, Rios X, Aach J, Church M: Genome engineering in Saccharomyces cerevisiae using CRISPR-Cas systems. Nucleic Acids Research 2013. 41(7), 4336-4343. Abstract: Our Team developed a universal toolkit, termed uniCAS, that enables customizable gene regulation in mammalian cells. Therefore, we engineered the recently discovered and highly promising CRISPR/Cas9 system. The regulation is based on the RNA-guided Cas9 protein, which allows targeting of specific DNA sequences. Our toolkit comprises not only a standardized Cas9 protein, but also different effector domains for efficient gene activation or repression. We further engineered a modular RNA plasmid for easy implementation of RNA guide sequences. As an additional feature, we established an innovative screening method for assessing the functionality of our uniCAS fusion proteins. Single genes and even whole genetic networks can be modified using our uniCAS toolkit. We think that our toolbox of standardized parts of the CRISPR/Cas9 system offers broad application in research fields such as tissue engineering, stem cell reprogramming and fundamental research. Ishino, Y., et al. (1987). Nucleotide Sequence of the iap Gene in Escherichia coli. Journal of Bacteriology 169, 5429-5433. Barrangou, R., et al. (2007). CRISPR provides acquired resistance against viruses in prokaryotes. Science 315, 1709-1712. Marraffini, L., and Sontheimer, E. (2008). CRISPR interference limits horizontal gene transfer in staphylococci by targeting DNA. Science 322, 1843-1845. Jansen, R., et al. (2002). Identification of genes that are associated with DNA repeats in prokaryotes. Molecular Microbiology 43, 1565-1575. Makarova, K., et al. (2011). 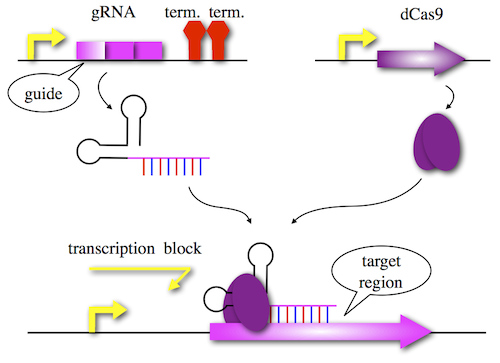 Evolution and classification of the CRISPR-Cas systems. Nat Rev Microbiol 9, 467-477. Jinek, M., et al. (2012). A programmable dual-RNA-guided DNA endonuclease in adaptive bacterial immunity. Science 337, 816-821. Cong, L., et al. (2013). Multiplex genome engineering using CRISPR/Cas systems. Science 339, 819-823. Mali, P., et al. (2013). 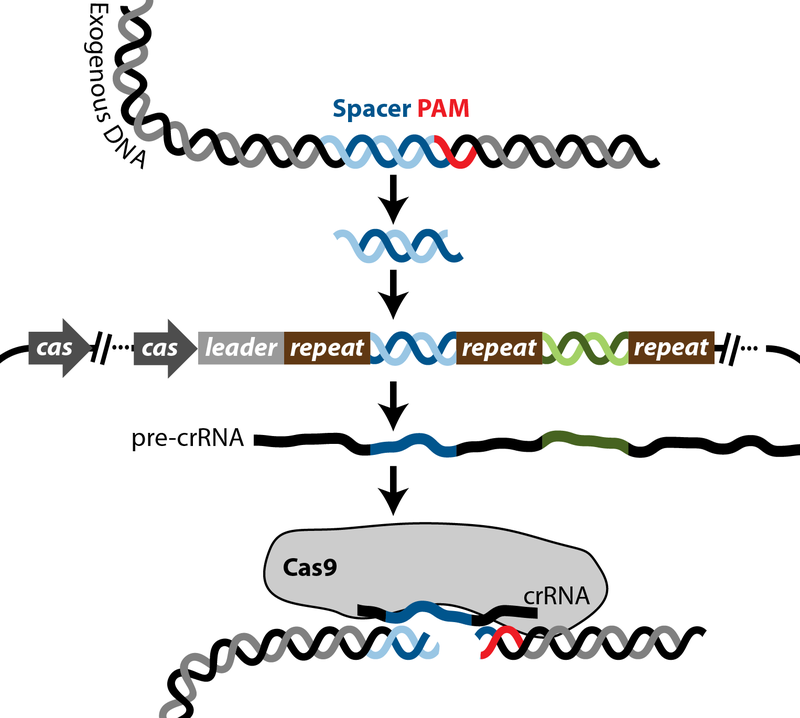 RNA-guided human genome engineering via Cas9. Science 339, 823-826. Yamanaka, S., et al. (2012). Induced Pluripotent Stem Cells: Past, Present and Future. Cell Stem Cell 10, 678-684. Kaneshiro, K., et al. (2007). An integrated map of p53-binding sites and histone modification in the human ENCONDE regions. Genomics, 177-188. Abstract: Coordinating behavior across cell populations to form synthetic tissues requires spacial communication between individual cells. While there has been some success engineering single signals, sending multiple signaling elements spanning spatial scales for multicellular coordination remains a significant hurdle. Here, we describe a method for mammalian cell-cell communication utilizing engineered exosomes containing miRNA or protein signals. First, we demonstrate selectively packaging signaling miRNAs (miR-451 and miR-503) and synthetic fusion proteins (GFP, Cas9, and Cre recombinase each individually fused to the oligomerizing membrane targeting domain Acyl-TyA) into exosomes within cells engineered with sender genetic circuits. Next, we demonstrate that these miRNA and protein signals can modulate gene expression within cells engineered with receiver genetic circuits. Finally, we present preliminary cell-cell signaling results on populations of cocultured sender and receiver cells. Our method may enable multiplexed communication among populations of various cell types and the creation of sophisticated synthetic tissues. 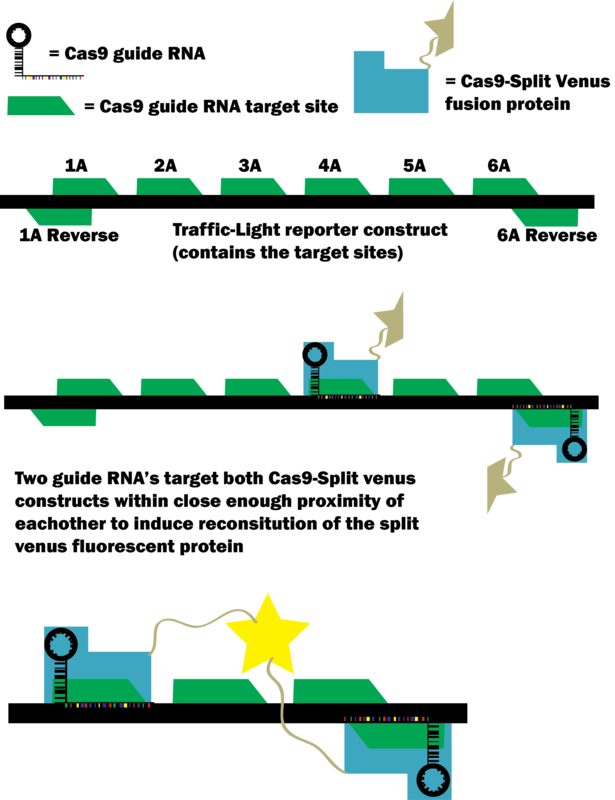 Abstract: Most bacteria and archaea can resist invading DNA and/or RNA elements via the clusters of regularly interspaced short palindromic repeats (CRISPRs).It is believed that the integrated CRISPR sequences have the ability to form a genetic memory which prevents the host from being infected.The memory exist as a DNA library in genome, artificially modified to set its target. The CRISPRs and Cas (CRISPR-associated) interact and form this prokaryotic adaptive immune system. 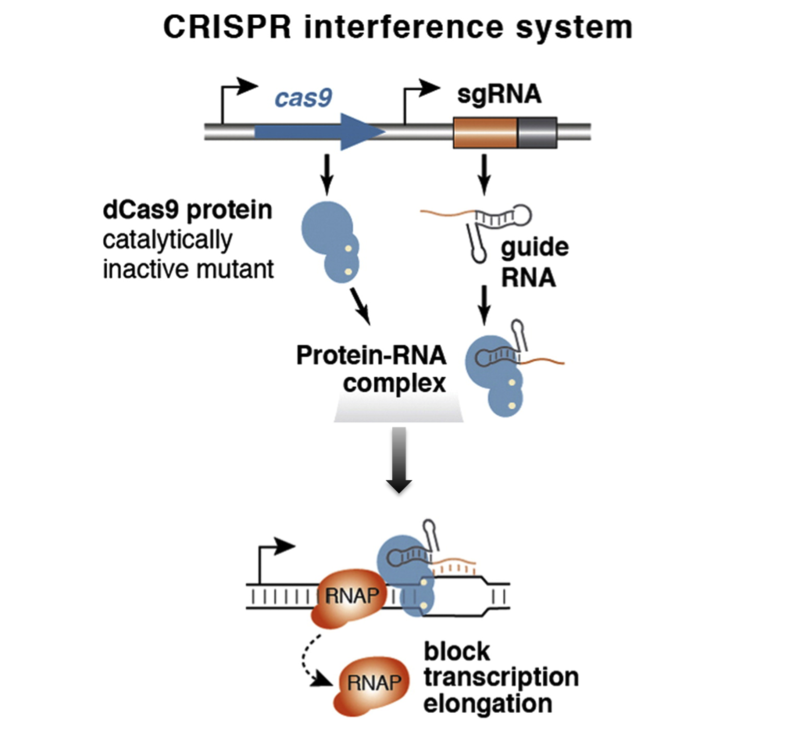 Cas9, as a core of CRISPR system, can play a role of targeted-attacking gene "missiles". Therefore, we build a sort of plasmids, loading CRISPR system, to realize the "killing" of harmful genes and/or organisms. Zhang J, Rouillon C, Kerou M, et al. Structure and mechanism of the CMR complex for CRISPR-mediated antiviral immunity[J]. Molecular cell, 2012, 45(3): 303-313. Brouns S J J, Jore M M, Lundgren M, et al. Small CRISPR RNAs guide antiviral defense in prokaryotes[J]. Science, 2008, 321(5891): 960-964. Díez-Villaseñor C, Almendros C, García-Martínez J, et al. Diversity of CRISPR loci in Escherichia coli[J]. Microbiology, 2010, 156(5): 1351-1361. Marraffini L A, Sontheimer E J. CRISPR interference limits horizontal gene transfer in staphylococci by targeting DNA[J]. science, 2008, 322(5909): 1843-1845. Shen B, Zhang J, Wu H, et al. Generation of gene-modified mice via Cas9/RNA-mediated gene targeting[J]. Cell research, 2013. Westra E R, Swarts D C, Staals R H J, et al. The CRISPRs, they are a-Changin': how prokaryotes generate adaptive immunity[J]. Annual review of genetics, 2012, 46: 311-339. Cong L, Ran F A, Cox D, et al. Multiplex genome engineering using CRISPR/Cas systems[J]. Science, 2013, 339(6121): 819-823. Karginov F V, Hannon G J. The CRISPR system: small RNA-guided defense in bacteria and archaea[J]. Molecular cell, 2010, 37(1): 7-19. Mali P, Yang L, Esvelt K M, et al. RNA-guided human genome engineering via Cas9[J]. Science, 2013, 339(6121): 823-826. Barrangou R, Horvath P. CRISPR: new horizons in phage resistance and strain identification[J]. Annual review of food science and technology, 2012, 3: 143-162. Hale C R, Majumdar S, Elmore J, et al. Essential features and rational design of CRISPR RNAs that function with the Cas RAMP module complex to cleave RNAs[J]. Molecular cell, 2012, 45(3): 292-302. Semenova E, Jore M M, Datsenko K A, et al. Interference by clustered regularly interspaced short palindromic repeat (CRISPR) RNA is governed by a seed sequence[J]. Proceedings of the National Academy of Sciences, 2011, 108(25): 10098-10103. Abstract: We are testing new weapons for the global war against Mycobacterium tuberculosis (MTb), a pathogen that infects nearly 2 billion people. Our 4 synergistic projects aim to help in the prevention, diagnosis, and treatment of tuberculosis. 1) We are reproducing an essential MTb metabolic pathway in E. coli, where it can be easily and safely targeted in a drug screen. 2) We are building a phage-based biosensor to allow the rapid diagnosis specifically drug-resistant MTb strains. 3) We are constructing a mycobacteriophage to detect and counterselect drug-resistant Mtb in the environment. 4) We are programming E. coli to follow MTb into human macrophages and saturate it with bacteriolytic enzymes. We want to vanquish tuberculosis and build a TB-free world. Abstract: Plants as Plants: Natural Factories provides a green approach to the manufacturing of valuable chemicals and materials. Through synthetic biology, we are able to control the expression of genes that regulate the production of desired secondary metabolites. Via the manipulation of established metabolic pathways, we hope to produce vanillin and butanol. The prospect of being able to synthetically produce a biofuel provides vast possibilities for the scope of synthetic biology and green energy. Additionally through the manipulation of the cellulose synthase genes, we hope to increase the biomass of plants by a hybrid plant cell wall. As shown through these projects, the use of plants provides various green energy possibilities. However, due to the limited use of plants within synthetic biology there are various regulation issues. Thus we have additionally worked on characterizing a range of plant promoters as well as introducing the Cas9 crisper system into plants. Abstract: Few researches have been done to regulate gene expression levels in genomic scale so far. This year we aim to combine two systems together in order to provide a universal and convenient tool which can be used to regulate different genomic genes simultaneously and independently in a quantitative way. Our project involves the newly developed gene regulating tool CRISPRi and three light-controlled expression systems induced by red, green, and blue light respectively. Simply by changing the regulating parts in CRISPRi system towards mRFP, luciferase, and three enzymes, we hope to prove our system can be used qualitatively, quantitatively and practically step by step. We have also designed a box and written a software as our experiment measurements. Simply by typing in several parameters, different gene expression levels can be controlled. This system can also be improved to predict the maximized producing efficiency after some simple tests in future. LEVSKAYA, A., CHEVALIER, A. A., TABOR, J. J., SIMPSON, Z. B., LAVERY, L. A., LEVY, M., DAVIDSON, E. A., SCOURAS, A., ELLINGTON, A. D., MARCOTTE, E. M. & VOIGT, C. A. 2005. Synthetic biology: engineering Escherichia coli to see light. Nature, 438, 441-2. FU, Y., FODEN, J. A., KHAYTER, C., MAEDER, M. L., REYON, D., JOUNG, J. K. & SANDER, J. D. 2013. High-frequency off-target mutagenesis induced by CRISPR-Cas nucleases in human cells. Nature Biotechnology, 31, 822-826. CARROLL, D. 2013. Staying on target with CRISPR-Cas. Nature Biotechnology, 31, 807-809. Abstract: Communication is a dynamic requirement for life as we know it. We are using cellular and molecular messaging of different magnitudes to improve the broadcasting and reception of information. Starting on the atomic level, our BioWires project has created silver-incorporating DNA to act as nanowires, which could improve the cost and effectiveness of electronic products. Our CRISPR project is creating a system for DNA messages and resistances to be passed from cell to cell, in effect, creating transmissible probiotics and changing the way that cells communicate. We are also building a chromogenic biosensor to detect sucrose secretion that will be launched on a satellite (EuCROPIS) into low-Earth orbit. Finally, our De-Extinction project involves decoding messages from the past to better understand early life on Earth. Bikard, D., Jiang, W., Samai, P., Hochschild, A., Zhang, F., & Marraffini, L. A. (2013). Programmable repression and activation of bacterial gene expression using an engineered CRISPR-Cas system. Nucleic Acids Research. Deltcheva, E., Chylinski, K., Sharma, C. M., Gonzales, K., Chao, Y., Pirzada, Z. A., ... & Charpentier, E. (2011). CRISPR RNA maturation by trans-encoded small RNA and host factor RNase III. Nature, 471(7340), 602-607. Jiang, W., Bikard, D., Cox, D., Zhang, F., & Marraffini, L. A. (2013). RNA-guided editing of bacterial genomes using CRISPR-Cas systems. Nature biotechnology, 31(3), 233-239. Jinek, M., Chylinski, K., Fonfara, I., Hauer, M., Doudna, J. A., & Charpentier, E. (2012). A programmable dual-RNA–guided DNA endonuclease in adaptive bacterial immunity. Science, 337(6096), 816-821. Mali, P., Yang, L., Esvelt, K. M., Aach, J., Guell, M., DiCarlo, J. E., ... & Church, G. M. (2013). 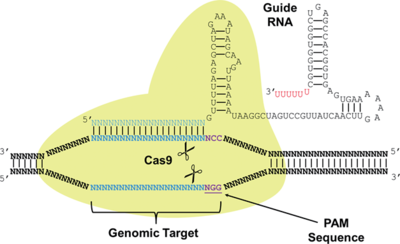 RNA-guided human genome engineering via Cas9. Science, 339(6121), 823-826. Wang, H., Yang, H., Shivalila, C. S., Dawlaty, M. M., Cheng, A. W., Zhang, F., & Jaenisch, R. (2013). One-step generation of mice carrying mutations in multiple genes by CRISPR/Cas-mediated genome engineering. Cell. Abstract: In microbial communities, bacterial populations are commonly controlled using indiscriminate, broad range antibiotics. There are few ways to target specific strains effectively without disrupting the entire microbiome and local environment. The goal of our project is to take advantage of a natural horizontal gene transfer mechanism in bacteria to precisely affect gene expression in selected strains. We combine bacterial conjugation with CRISPRi, an RNAi-like repression system developed from bacteria, to regulate gene expression in targeted strains within a complex microbial community. One possible application is to selectively repress pathogenic genes in a microbiome, leaving the community makeup unaffected. In addition, we use CRISPRi to lay the groundwork for transferring large circuits that enable complex functionality and decision-making in cells. Abstract: Cas9 is an RNA-guided dsDNA nuclease utilized by bacteria immune system. The genetically engineered Cas9 has recently been shown to have the ability to repress or activate desired gene expression. In practical research and industrial application, we usually face the problem to express a gene at different levels, not only “on” or “off ”, so a more flexible regulation method is needed. 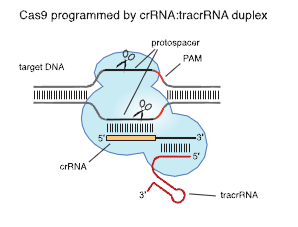 To achieve multi-stage regulation of target genes, we further develop several dCas9 devices in which dCas9 alone or fused with omega subunit of RNAP is directed by various guide RNAs to different regions of designed double promoters. Therefore, promoters with disparate strength can be either activated or repressed respectively and multi-stage gene expression can be achieved. Also, based on such novel technology platform, we are developing diverse applications such as a guide RNA-mediated oscillator. Bikard, D., et al., Programmable repression and activation of bacterial gene expression using an engineered CRISPR-Cas system. Nucleic Acids Res, 2013. 41(15): p. 7429-7437. 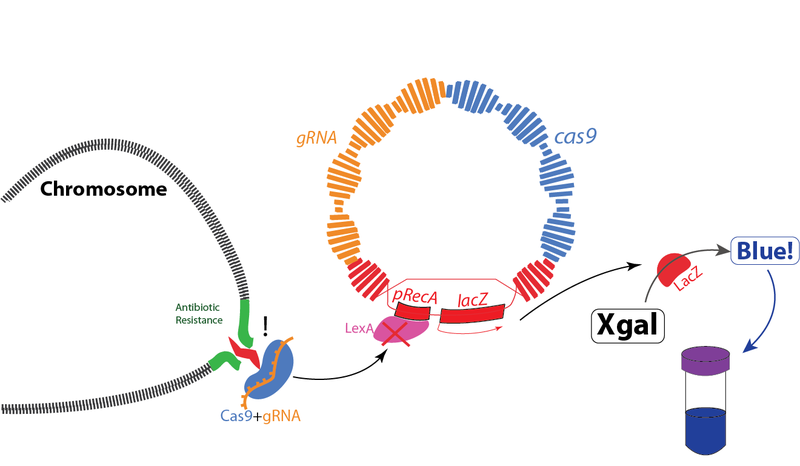 Heidrich, N. and J. Vogel, CRISPRs extending their reach: prokaryotic RNAi protein Cas9 recruited for gene regulation. EMBO J, 2013. 32(13): p. 1802-4. Li, M., et al., A strategy of gene overexpression based on tandem repetitive promoters in Escherichia coli. Microb Cell Fact, 2012. 11: p. 19.